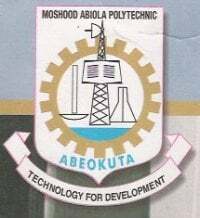 The Management of the Moshood Abiola Polytechnic (MAPOLY), Abeokuta, after reviewing the academic calendar for the first semester 2013/2014 session, has stated that the mid-semester examination will now hold between Tuesday, 22nd and Monday 28th April, 2014 to allow for the Easter celebration. The examination, which will be undertaken by all categories of students (excluding all NDII Students, who have just resumed, having been on SIWES for 4 months), is only intended for those who have completed registration for the semester. The NDII students’ mid-semester examination will hold between 12th and 16th May, 2014. Any student, who fails to complete his/her registration on or before the late registration deadline, will be ineligible to participate in the mid-semester examination. In a related development, Management has also reiterated that all newly-admitted Full-Time students (National Diploma and Higher National Diploma), who fail to effect payment of school fees before the expiration of the deadline stand a risk of being migrated to the Part-Time programme on the course. This directive becomes imperative following the Management’s assessment of students’ registration for the first semester 2013/2014 academic session. Similarly, all returning Full-Time and Part-Time National Diploma and Higher National Diploma students are advised, in their own interest, to complete their registration on time. Any student, who fails to adhere to this directive, will be prevented from participating in the mid-semester examination.